Are all of you having a great weekend so far? I certainly hope you have some great plans for this lovely Saturday. I’m actually only going to be online long enough just to supply you all with a brand new optical illusion and then I am going to go outside and enjoy the weekend. I have a lot of things I have to get done today. What are you going to do today? Leave a comment and let me know. Today, I have an optical illusion that is absolutely wicked. 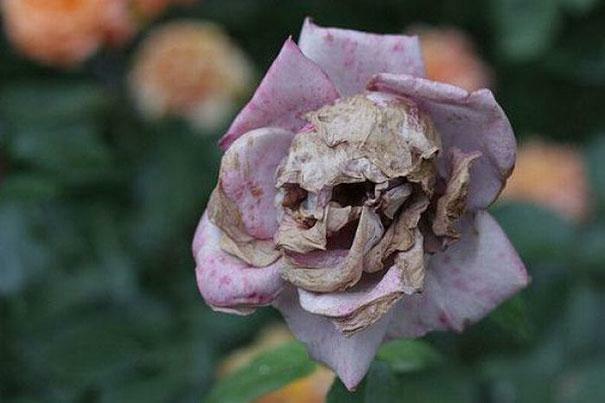 As you probably guessed from the title of this post; this is going to be an optical illusion involving a dead flower, but you’re probably wondering how a dead flower could be part of an optical illusion. Well, you’re probably about to be blown away by the image I’m going to post. Are you ready to check it out? If so, you can scroll down right now. Now, the first thing you probably noticed is that this flower is dying and it’s like you can see its skull, which is a representation of death. I have to ask: Do you think this is a natural picture or do you think this flower and/or picture has been manipulated and made to look like this? Let me know by leaving a comment below. Do you want to see another great optical illusion? If so, you should check out this Lionmouse Optical Illusion. Natural, I have raised Roses for years although this is a first, the decacy is similar, I do not beleive it was photoshoped.